The London-based Bureau of Investigative Journalism is less than two years old, but since its inception has scored a series of impressive scoops. Most recently, it established that US drones in Pakistan had killed scores of civilians – directly contradicting Barack Obama’s claims just a few days previously. By REBECCA DAVIS. It is often lamented that one of the major failings of the modern media landscape has been the demise of in-depth, investigative journalism. As media outlets battle to keep pace with a 24-hour news cycle which sees news break and be disseminated more quickly than ever – particularly online, and by broadcasters – the existence of specialised investigative journalists, who will work for months to painstakingly uncover a story, is increasingly a rare luxury. A 2006 study by Arizona State University found that, although 42% of the largest newspapers in the US expressed “a lot” of interest in investigative reporting, this was not matched by the time and resources given to journalists. Thirty-seven percent of newspapers had no full-time investigative reporters and the majority of those that did had two or fewer. Teams like the Mail & Guardian’s AmaBhungane are increasingly rare. Others say the notion of a “golden era” of investigative journalism is misplaced nostalgia, with investigations like Watergate being the exception to the rule in any era. There is also an argument to be made that it is easier than ever to carry out investigative reporting today, due to the availability of documents online and elsewhere thanks to freedom of information legislation. And, of course, there’s other more controversial sources of information available today: who needs to spend months painstakingly tracing a paper-trail when WikiLeaks has already laid out classified diplomatic cables on a plate? One effect of the Leveson Inquiry into UK media is to make editors more wary about the sources of its journalists’ scoops and the methods used to gain access to these. In the post-News of the World climate, while everyone is in agreement that voicemail and emailing hacking is unacceptable, an unintended fallout may be a much greater timidity about publishing scoops or undertaking investigations. But into the breach rides the BIJ, a non-profit organisation set up specifically to encourage a new generation of investigative reporters. Based at City University in London, it works in collaboration with news outlets to undertake and publish investigations. In its two years of existence, it has landed more than 34 front-page scoops and won numerous awards. And it was co-founded by two South Africans: David and Elaine Potter, who launched it with a £2-million donation from their charitable David and Elaine Potter Foundation. You may recognise the name of David Potter, a physicist who founded software company Psion in 1980. Psion was responsible for developing the world’s first hand-held computer, ‘The Organiser’, in 1984. In 1988 Potter worked with Nokia, Ericsson, Motorola and Matsushita to create the Symbian operating system which is standard for smartphones. Potter stood down from Psion in 2009, and since then has busied himself with various councils, advisory boards and his own charitable endeavours. In the establishment of the BIJ, his wife Elaine, a journalist at the UK’s Sunday Times for many years, has had a longstanding commitment to the ideals of investigative reporting. Among her co-authored publications was 1979’s Suffer the children: the story of thalidomide, which told the story of how the Sunday Times uncovered the truth about the likely effects of the drug thalidomide, but were prevented from revealing the news to the public because British laws at the time prohibited commenting on cases in the courts. In April 2010, when the Potters made the £2-million grant to launch the BIJ, Elaine said their goal was to “support investigative journalism of the highest ethical standards and to search for sustainable models for its long-term future”. It is this latter goal that may prove their greatest stumbling-block. On the occasion of the bureau’s first birthday in April last year, editor Iain Overton said their biggest challenge had not been undertaking investigations, but persuading media outlets to publish the results. As a result, when they have not been able to place material, they have on occasion given it away freely under a creative commons license. While this in itself cannot constitute the “sustainable model” for which Potter hoped, Overton said he believed that “over time the saviour of quality investigative journalism may be micro-payments” – such as, for instance, people paying a small fee to access online documentaries. In the meantime, though the BIJ has carried out an impressive number of investigations which made headlines globally. Their first major report in June 2010 looked at the World Health Organisation’s response to the bird flu pandemic, and in particular its recommendation that health authorities stockpile the drug Tamiflu. The BIJ found that the three scientists recommending Tamiflu to the WHO were in the pay of Tamiflu’s manufacturer, Roche. This finding resulted in the WHO reviewing its conflict of interest regulations. In December 2010 the BIJ won the annual Thomson Reuters Reporting Europe Award for a nine-month investigation into how the European Union’s structural funds pot was used. The results, eventually published in the Financial Times, BBC and Al Jazeera, showed the system was rife with corruption. They landed another doozy in 2011 with an investigation into the funding of the UK’s Conservative Party. They uncovered the fact that 50% of donations to the Tories came from the financial services industry and that large sums donated by individual bankers would give them the ear of senior Tory politicians, including Prime Minister David Cameron. Given that the party was at that point ostensibly dedicated to the regulation and reformation of the banking industry, that didn’t look too good. This month they published one of their biggest scoops, in collaboration with the UK’s Sunday Times. A few days previously, US President Barack Obama had participated in an online Q & A session with ordinary Americans, in which he had been grilled about the use of CIA drones in Pakistan. Obama explicitly dismissed “this perception we’re just sending in a wild bunch of strikes willy-nilly”. The use of drones, he said, was a “targeted, focused effort” which had “not caused a huge number of civilian casualties”. Staff at the BIJ must have been rubbing their hands with glee, knowing they were about to go to print with a direct refutation of his claims. Their nine-month investigation, based largely on interviews with witnesses, found that in the three years since Obama took power, between 282 and 535 civilians (including 60 children) had been “credibly” reported as killed. The investigation also found evidence that drone strikes were deliberately targeting funerals and civilians who went to help victims of previous strikes. American counterterrorism officials responded by claiming the witnesses interviewed might be deliberately misleading the journalists out of fear of punishment by militants if they didn’t parrot the anti-US line. As The New York Times pointed out, however, the BIJ’s investigation was the first to actually interview affected villagers – previous reports had “relied on sketchy and often contradictory news reports from Pakistan”. U.S. said to target rescuers at drone strike sites in The New York Times. 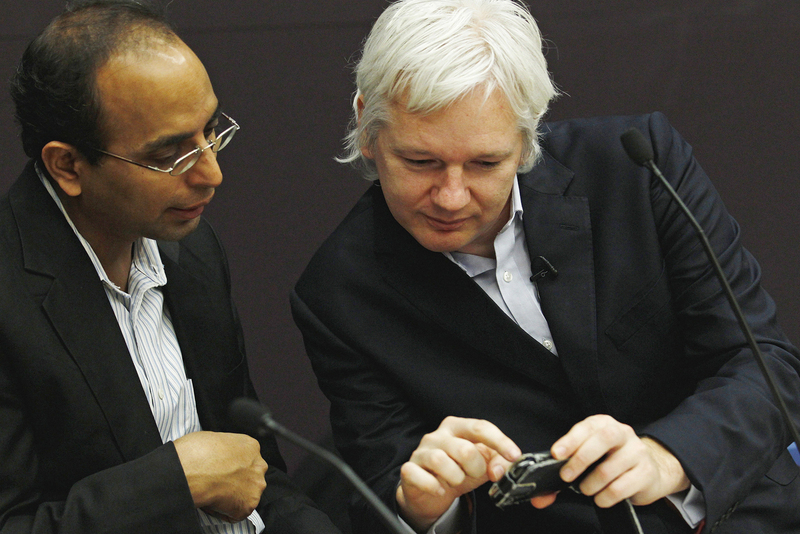 Photo: Founder of whistle-blowing website Wikileaks Julian Assange (R) and Pratap Chatterjee of the Bureau of Investigative Journalism use a mobile phone during a news conference at the City University London in London December 1, 2011. REUTERS/Luke MacGregor.